Outside of the obvious die shrink what is new under the hood of the Ivy Bridge CPU? Well for starters there is the PCIe Generation 3 support. This new generation of PCIe (Peripheral Component Interface-Express) has a theoretical 8GT/s which is 8Gigatransfers per Second or about 8Gigabits per second which equals 1 Gigabyte of data per lane per direction of bandwidth to play around with. This is double the bandwidth available to PCIe Gen 2 at 4Gbps (5GT/s). If you add that up for your average full x16 PCIe slot this gives you around 32GBps of bandwidth for your graphics cards. In addition to having more room for add-in GPUs Intel has upped the ante on the build in GPU. This is the new GMA4000. Under the hood the number of Execution units has been bumped to 16. Each of these can handle one 128-bit execution per clock. The GMA4000 also has support for SIMD8 and SIMD16 instructions for vertex and pixel processing respectively. You also get DX11 support with the GMA4000 which is good, but we will reserve our happiness until we see if it can really handle DX11 gaming. Intel has not just dropped in a GPU for graphics though. As with many GPU manufacturers they have recognized the benefit of the highly parallel nature of a GPU. To this end they have dropped in (much of this was there in Sandy Bridge as well) a few nice instructions to allow you to take advantage of these extra processors. Some of the technology behind this includes an update to Intel’s Quick Sync Video which can provide up to twice the encoding/transcoding performance that we saw with Sandy Bridge. In addition to DX11 you also get updated support to OpenCL 1.1 and OpenGL 3.1. 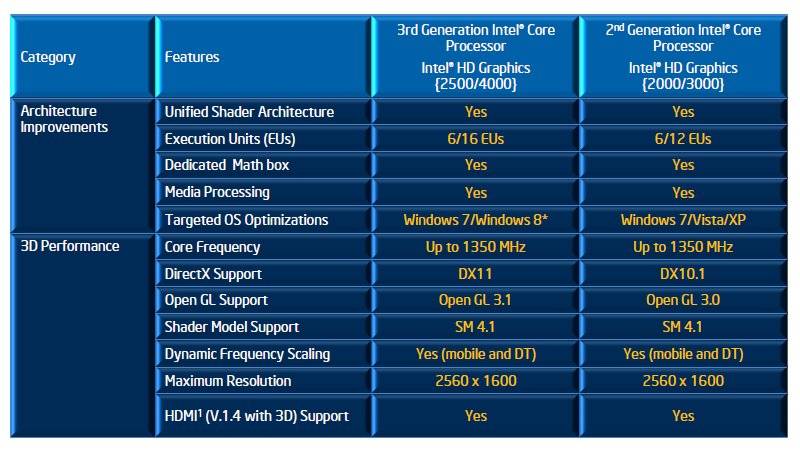 One of the reasons for the update to the GPU inside Ivy Bridge is the move to 3D content. Intel needed to revamp the GPU in order to take advantage of 3D displays as well as the expected increase in the amount of 3D content people will be dealing with. From some information we are seeing on the industry we will actually see more 3D hardware in 2012-2013 than 2k. This means more consumer oriented cameras, camcorders and yes more 3D phones. Ivy Bridge with its GMA4000 and Intel Quick Sync will allow for native viewing and editing of stereo 3D content (of course your display will need to handle it). You will also have the potential to convert standard 2D movies and photographs into 3D. 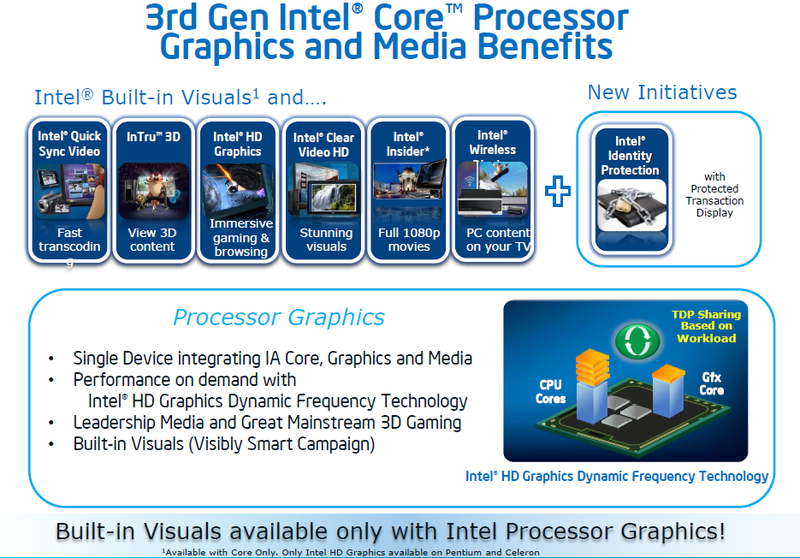 Viewing of 3D content (again with a supported display) is handled with Intel’s InTru 3D. Another item that will help out with content creation is Intel AVX (Advanced Vector Extensions) this set of instructions will help out with intense floating point operations like those that are in most video and audio encoding/editing applications (and ties in with Quick Sync in many ways). Intel has also improved their AES-NI (Advanced Encryption Standard - New Instructions) they have added in a hardware based random number generator which will improve performance for encrypting and decrypting information (it also has some security benefits). Most of the rest of the improvements are either minor tweaks to existing instructions or they deal with low-level power controls like PAIR (Power Aware Interrupt Routing). Starting with Lynnfield Intel had to deal with interrupt issues from the PCIe buss and memory controller running on the CPU. These often and interfere with power management. 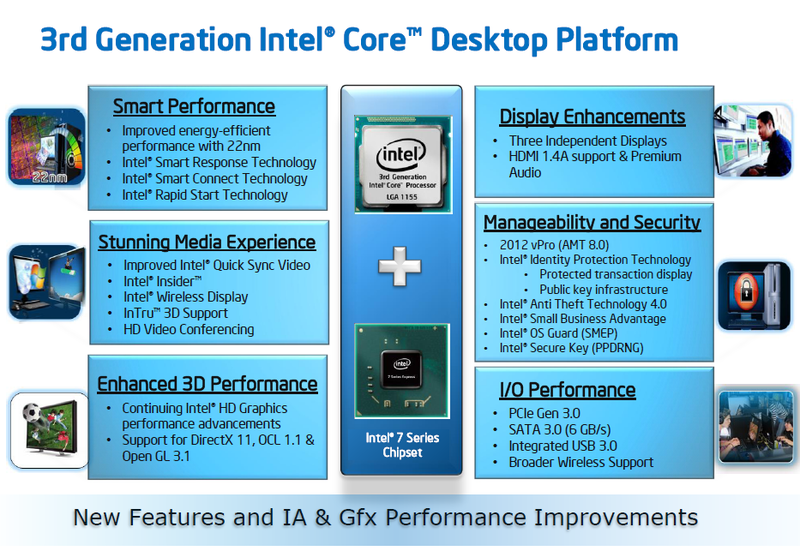 Intel has added in PAIR to help offset this. When a system needs more power it can wake sleeping cores instead or taxing ones that are already working. When it does not, it can leave those cores alone to save power. Examples of this would be LAN and WLAN traffic, some USB peripherals and even some add-in boards that do not need maximum CPU time to work.